It's always nice to see decorative pieces in offices and home alike, such as indoor fountains. They are a wonderful way to add an accent to any business or office. Having an indoor fountain in an office is a surefire way of providing that touch of relaxation to the customers, clients, and even colleagues. 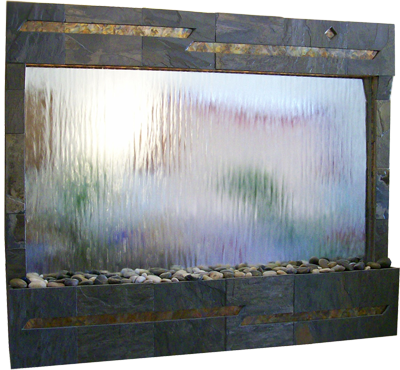 Indoor and custom fountains are wonderful because they can add that air of peace to any place. Have a boring room? Maybe a waiting room of some sort? Adding a fountain means adding a beautiful touch to the office. Not only will the customers enjoy the indoor fountain, but staff and clients alike will be able to appreciate its soothing feeling. Whether a lawyer, a manager at a bank, or even a local worker at a post office or the shopping mall, adding decorative attire is a great way of welcoming customers and bringing in more potential business. A fountain to a business can be one of the best moves on the company's part to draw in a larger crowd because these beautiful pieces of artwork tend to be very calming. A soothing effect on the customers is easy with the pleasurable sounds of soft bubbling water. When a calm environment is the goal, an indoor fountain definitely beats radios by a long shot, and allows people to collect their thoughts before heading out to a meeting. Another fine example is adding them at government offices. This is because a government office may be more intimidating than other businesses. 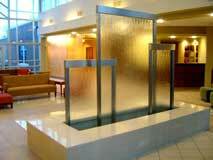 So adding the calming effects of the indoor fountain is just the way to help people feel more relaxed. While it all depends on personal opinion, adding an indoor or custom fountain to certain areas can help benefit the company versus other places. For example, it should be placed somewhere where there is typically high traffic. This allows the calming sensation of the fountain to be felt by more people, from staff to clients to customers. A few good examples is to place it by the office, in the waiting room, or even outside of the bathroom. These are all high traffic places. The best choice is where guests will more likely be located. Investing in indoor fountains is a great way of adding a combination of decorative flare and relaxation to any office. Businesses who have one or more of fountains will be sure to benefit because it provides that calming sensation that everyone loves. And best of all, everyone can enjoy. So stop hesitating and look into making that office even more beautiful than ever.